Illustrated here by Edward Gorey at the moment of the name revelation. 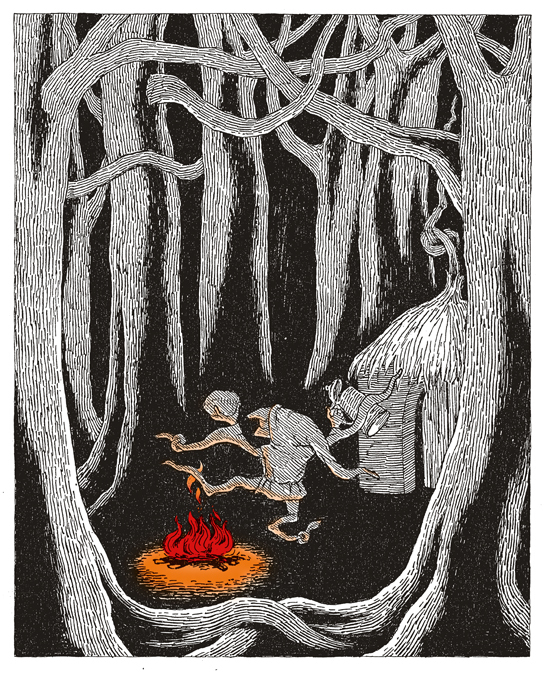 The brothers Grimm tale Rumpelstiltskin reminds us of the potency of a name. According to Maria Tatar, “Knowing the name of your antagonist represents a form of control, a way of containing the power of the adversary and having influence over his soul.” Tartar goes onto explain that names are a vital part of one’s identity and in myths and fairytales, careless revelations can lead to transformations. Below students touch on the phonesthemic qualities in their name and explore the etymologies and family history behind their naming. No careless revelations and no beastly transformations! Students have read Sandra Cisernos’s extract from House on Mango Street where the character discusses her name ‘Esperanza’ and in doing so reflects her personality, values, as well as the etymology and story behind her name. Students have spent time talking to their parents about their names and the stories behind this. For some it’s as simple as their parents just liked the sound, for others it’s a tie to the past or wishes for the child’s future. Students have found that names, like words have a history, an etymology, and have investigated this in their writing. Names too carry a sound sense with them suggesting maleness or femaleness. Many female British or European names tend more to the polysyllabic, whereas more male names are monosyllabic. 95% of male names have a heavily stressed first syllable whereas far less female names do this. Crystal (Encyclopaedia of the English Language,153) indicates that over the past 75 years none of the popular male names had an unstressed first syllable ( Patrick, Jonathan, Robert, Christopher, William). Female names usually have a stressed high front vowel /i/. In our class we see this in the names: Tiffany. Often female names end with a spoken vowel: Mari, Hannah, Temirah, Chloe, Anna, Jemma, Tatiania, Nikoletta, Athina,Emma, Shania. If not ending with a vowel sound, the final sound will be a continuant in female names: /l/ Michelle,or the nasal continuants such as /m/,/n/: Kathleen, Madeleine. I began to wonder about the phonesthemic qualities in various character names, particularly in Dickens. Consider Ebeneezer Scrooge. The sound of Scrooge’s name seems to reflect the character’s miserly stinginess, the unpleasantness and heartlessness. Perhaps an association between scrounge and screw, scrimping and scraping. Look at /skr/ in Shisler’s Dictionary of Phonesthemes. My students familar with Dahl can see how Dahl too suggests character traits through the name: Miss Trunchbull from Matilda is a noteable example. ‘My name is Irish. It means full of honour. It comes from the Latin name Patricius, which meant “nobleman”. The name Patrick, was not given in Ireland before the 17th-century because it was too sacred for everyday use. After that, it became very common there. The name was adopted by Saint Patrick in the 5th- Century, whose birth name is Sucat. This name was used in honour of the saint during the middle ages. Saint Patrick was also known for driving the snakes out of Ireland. There are no snakes in Ireland, that is a fact, but there probably never was. It is pretty cool to be named after someone who was a hero. It is also a coincidence that St. Patrick’s day is celebrated on March 17th. My birthday is on October 17th. Patrick. The sound of the name was beautiful. It was like music to my parents’ ears. My name is not common in Indonesia and it is not an Indonesian name, but my Indonesian parents picked it because they liked the sound of it. They thought it fitted me perfectly. There was no special reason they picked Patrick. They just liked it. After all, it meant full of honour. I think that is what they expected me to be, full of honour’. ‘‘In Latin my name means young. In French my name means youth. The Italians spell it with just six letters. The French spell it with eight. My name is a reminder of a tragic love story. The color purple, the sound of rich classical music, the heavy evening scent of jasmine flowers. You probably know my name because of William Shakspeare. He chose Romeo to be the ill-fated lover of Juliet. As a class we also discussed nicknames, which led to an investigation of this word. In the 1300s it was ekename from eke name meaning additional name as the root of eke is OE eacian to increase. Nickname therefore has been formed by misdivision. The last word on names should be with the brilliant Alan Bennet. Delicately balanced between tragedy and comedy, his writing is poignant, wistful, wry. Below Alan Bennett reflects on names as a person ages. He shows that names reflect a generation, a slice of time as well as a determination to distance a baby from age. He reminds readers that whatever the name,however assiduously we bequeath a vibrant name avoiding the elderly or geriatric, age is inevitable. Listen for the sheer pleasure of hearing a writer who is indeed a master of words. ’Sharons don’t suffer from dementia’ He notes too how “The trumpet has not yet sounded for Trevor..but it will” or somewhat bleakly ”Soon the listless watchers by the radiator will be Melanie” He remarks on the gentrifying of names, of the class status of names. Of today’s Jacobs, he sees that they have been ‘sanded down and all its biblical varnish gone’. nugget perhaps ingot, notch, ninny, lone,newt,size, apron,auger,adder, humble pie. Check out Other misdivisions from Online Etymology Dictionary. What a beautiful post. I see in this and your previous post what I love about your teaching. You go beyond the word’s spelling, history, and pronunciation. You get your students to think about the feel of words. You ask them to think of how letter combinations in the initial position, medial, and final position of a word give that word a distinct feeling. I have long been a fan of Dickens and Dahl. The interesting character names are only one reason why. Your attention to this aspect of words will assure that your students will certainly gain an appreciation for word choice in all of its applications. Beautifully presented! Thankyou Mary Beth for your comments. I do love the feel of words. This seems so important to draw attention to with young readers and writers. It’s the way words combine with others in sentences, it’s the well chosen, well placed word that can create a vivid image, move a reader to tears or evoke laughter. It’s this awareness and passion that I hope to kindle with my students so that can appreciate those who are eloquent and powerful, as is the case with Alan Bennett or Charles Dickens. I hope this inspires them to enjoy using words wittily and well. I love this post so much, and the reflections you students have done on your own names. One of my favourite “young persons” novels is by Canadian Brian Doyle. Set in the granite country north of Ottawa, a few hours from where I live, it is called “Mary Ann Alice”–a girl named after the bell in the local church. She is a wonderful character: plain and freckled, but who, like the dull metal of a church bell, is filled with latent beauty and who stands out in surprising ways. What were the Monty Pythoners getting at when they named their Jesus surrogate “Brian”? As a parent and teacher, I have had occasion to think about names over the years. It is fascinating–as Alan Bennett observes in his gentle, jocular way–how names follow trends. When I first began teaching, the rooms were full of Sarahs and Jessicas, Jesses and Brandons. Already they are few. But the Debras and Susans and Jennifers of my youth have not returned. Where are all the Dougs? And though we try to stand apart from social trends, we find somehow we cannot. When we went to name our eldest daughter, we chose Abby, a pretty old name we’d never in our lives met anyone with. We soon discovered it was among the most popular names on the continent. How does this happen? Thankyou Skot for your reflections on this post. I have hunted down ‘Mary Ann Alice’ -and ordered this and others by Brian Doyle for our Grade 7 Class library. Thank you for this tip to a new author for me. I really enjoyed writing this post and researching information on names and the popularity of names. I had read a little about names that are illegal and stumbled upon the article that you have linked to. Interesting. Like you we named our daughters Imogen and Kezia as we had not met people of these names and therefore we felt that we weren’t saddling our girls with expectations of another personality. Since then we’ve seen a rise in the popularity of Imogen ( I like to think it’s our daughter that’s inspired it’s current popularity!) As for Kezia , we had not met any others but we were inspired by the wonderful Katherine Mansfield’s short stories The Garden Party- in particular At the Bay, The Doll’s House, Prelude which are set in New Zealand, where Mansfield grew up with her three sisters and brother. She moved later to London and was friend/rival of Virginia Woolf and others of the Bloomsbury set. Mansfield died in her early 30s. of tuberculosis- so young. Anyway we loved those short stories – hence Kezia one of the young children. Some months after the naming, we discovered a Kezia way back in Rob’s family! Thankyou for the Daves I know!! Will be sharing this with several of the Daves I too know! Laughed heartily at this particularly in the final moments with the backing and chorus with all Daves! A century and a half ago Dickens painted a picture of pedagoguery that in essence has not changed since, personified in the gloriously coined name of Thomas Gradgrind. Gradgrindery may well have adopted less malodorous names (or impressive disguises), but it is still with us and as mephitic as ever. As Shakespeare famously commented, a rose’s perfume does not alter with a change of name. A wonderfully inspiring post, Ann. Wonderful! Yet another great name!